Hmm I keep thinking I forgot something. Looks like you have some wonderful projects going....and someone to keep you company! I love that lantern i see peeking out in back. And what piles of luciousness to play with. I see you have a guardian on site, never know when a Zombie or two might drop in..or sneak out the trunk! Don't forget a camera and a video camera for pictures of cowboys in chaps on the road trip. Front and back views please. It's all I ask-I'm recovering from surgery and I need this more than percoset. Look at all that yumminess on the table!!! So much cuteness!! Fabric and bunny!! I don't know if you know this, but there is a rabbit on your bed! Check out my post from yesterday, it definitely applies to you ;) Cute bunny! I know you've been working on a bag using grays...but I'm thinking that pile in the middle of the bed isn't quite the right shade to go with the other prints. Miz Binz Quilt Co., she's cookin' up something darling for sure! OMG, seeing Binny reminded me of the GINORMOUS bunny we saw this weekend riding in her very own bunny stroller. I think she had snacks AND toys with her. What does Binny's stroller look like? If you take Binny, she will be the star of the show and provide some additional "trip interest", Pam! Can you see stopping at the pet rest stop with her - what a hoot! This picture is adorable! Love that bunny's expression. AW Pam, your wee lop bunny is adorable.Is she any help at all getting those patches together???? Thank you so much for producing such a lovely blog and sharing your life with us like this! 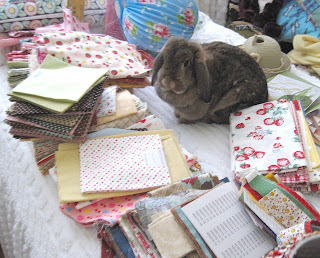 This photo of the bunny with the fabrics is just adorable!! Are you packing the bunny as a giftr for Anne. Or is the bunny going to follow her around Market. hehe Love the bag!!!!!! Egads! There's a rabbit on your table!